Interning at Enova: Strategy & Operations - Enova International, Inc.
After months of interviews, monotonous black-and-white suits, flat résumés that resembled every second CV in a recruiter’s pile, and cliché after cliché coming out of my mouth in an attempt to impress companies, I had finally found an internship for the summer. At first glance, Enova Financial seemed far from the company I thought would kick-start my career. But by the end, I knew that Enova was it. At the end of the Enova interview process, I felt challenged, not demotivated. I felt inspired by the full-time employees that led my interviews. And the more I learned about it, the more the consumer lending industry seemed as if it would make for a vibrant, stimulating summer. Now, six weeks in, it’s all coming together. I’ve constantly felt that to prove myself, I need to do more — show more — and for once, I want to build accomplishments to prove to myself, rather than my competition, that I can be successful. Coming in, I was unsure about whether a Strategy and Operations role would be the best fit for me at Enova. In school, I always really enjoyed studying finance and financial engineering, and my passion for models and simulation made me think that an analytics role would be more appropriate. However, for someone with varied interests who enjoys working with people more than numbers, S&O is close to a perfect fit. 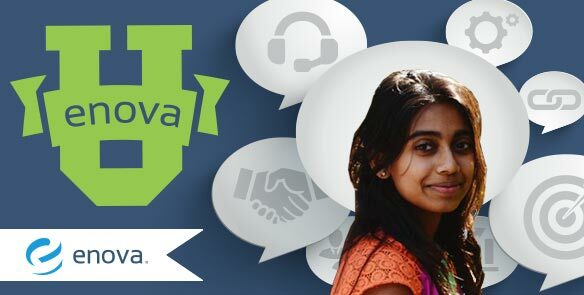 The talented people I work with at Enova do everything from building complex staffing models, to making structural database recommendations, to writing code, to implementing ways to make the call center representatives happier and more fulfilled in their work. I’ve learned that as an S&O, I can do anything. It’s almost like a rotational program fit into one position — where you get to try a variety of projects in a variety of different business functions, exploring projects that fit your interest while also making a true impact in the company. Let’s be honest. Once I am in a full-time position and have completed my schooling, I will never again be lower on the corporate hierarchy than I am now. But Enova has never made me feel undervalued. Every day, I come to work excited about what I will learn next. I’m constantly inspired by the brilliance around me, and I am constantly pushing myself to learn outside of my comfort zone. In less than three weeks, I was seamlessly writing SQL queries and unearthing data that had the potential to make an outstanding difference at Enova. Within the next week, I felt like a near expert in my project area, with the ability to speak fluently about the call center functions that I was working with. I am never bored and always challenged. I am growing with every task that I’m presented with, and I’ve learned to be critical, as criticism is the first step toward positive change. Being only six weeks into my internship, I do not know if I’m in the best position to give advice. But I do know a few things: For all the future interns, choose a company based not on what your preconceptions of what a “good company” to work for are, but based on whether the company can teach you exactly what you are looking to learn in a summer. I know I did. Don’t be afraid to speak up with your ideas and find people to work with who don’t hamper your thought process, who instead let it thrive in an appropriate context. Lastly, take your time to learn the business before jumping into the inner workings of your task. Enova’s three-week onboarding process is what made me a confident intern and set the stage for what I hope will be a successful, rewarding rest of the summer. This endless uphill has me excited. I can’t wait for the rest of the summer!